Loudersoft Is Worn The Eff Out — Bonnaroo Is Over, Rover. What a crazy several days it’s been here at Bonnaroo 2007. Let me start by saying thank you to all of the artists who performed for agreeing to come down here, being both patient and indulgent of the writers and photographers who packed this place out (along with 80,000 of our new closest friends). I also want to say a huge thank you to Nathan, without whom this adventure would have been highly self-indulgent and boring. I’m going to move quickly, so hold on to your hats. The Black Angels were hypnotic. Mute Math was terrific. The National were luminescent. Lewis Black & Friends were funny. David Cross, Aziz Ansari, and Nick Kroll were hilarious. Brazilian Girls were intriguing. Lily Allen was abrasive. The Richard Thompson Band were tremendous. Regina Spektor was kitschy. Gogol Bordello were stunning. Fountains of Wayne were idyllic. Spoon were spectacular. Ween were phenomenal. The Police were disappointing. Girl Talk were scintillating. Galactic and Guests were maggadocious. Aesop Rock was singular. El-P was jammin. DJ Shadow was prophetic. The Flaming Lips were interstellar. Wilco were breathtaking. Feist was delightful. 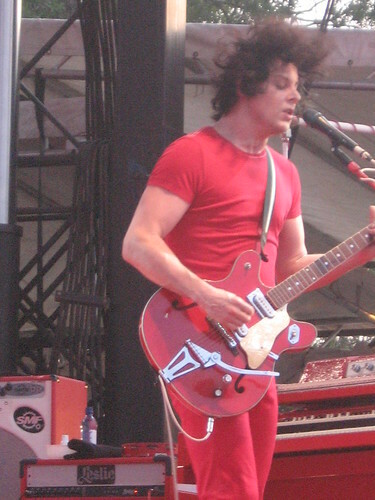 And, The White Stripes were showstopping. More when I get home, for now, its a long road home.